Ashley Gerasimovich is an American actress. She is most famous for her portrayal of Delilah Parker on the TBS comedy series The Detour. She played Claire in the 2011 comedy/drama film The Stand Up and appeared in FX comedy drama series Louie. Ashley also portrayed the role of Celia in the 2011 drama film We Need to Talk About Kevin. 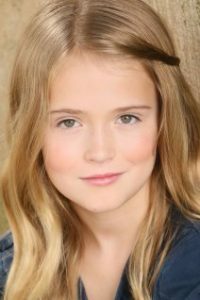 Born Ashley Elizabeth Gerasimovich on February 1, 2004 in New York City, New York, USA, she is the older sister of actress Erin Gerasimovich, and younger sister of actress Alexa Gerasimovich. She belongs to Russian and Irish descent. In 2009, she landed her first role in an episode of the TV series Mercy playing Katy Flanagan. Birth Place: New York City, New York, USA. *She was born on February 1, 2004 in New York City, New York, USA. *She is half Russian and half Irish. *She appeared with Tina Fey on an episode of 30 Rock. *She donated 38 toys in 2009 and 43 toys in 2010 to the charity Rocky Stone. *She has a pet guinea pig named Cannoli, and two bunnies named CC (chocolate cutie) and Brownie.